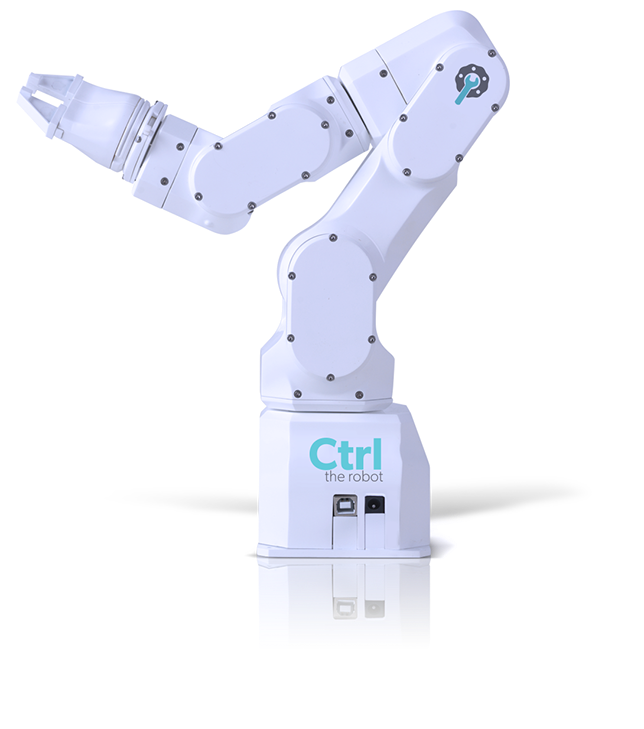 CTRL the robot is a desktop-sized robot arm that can do a lot! It enables your computer to perform manipulation of real objects via software and gives you access to technology that has been locked away in large corporations factories. Check this video to see the amazing features of CTRL. CTRL was launched on a Kickstarter campaign that unfortunately didn’t reach its goal of AU$ 215,000. The early bird product was sold for AU$ 699 (~ $540) and you were able to get two robots for AU$ 1598 (~ $1230).This robot arm is a fraction of the price of similar robots you might see in factories. It was developed by Robotics Evolved to be an affordable robot arm. Unveiled at CES 2017, this desktop-sized robot arm aims to make robotics more accessible to the masses. The device is open-source and can be run on the programming language of the user’s choosing. For those unfamiliar with code, CTRL can also learn to replicate movements when manipulated by hand.It ships with example applications with source code and ‘Motion CTRL Studio’ software to easily run diagnostics, visualise movements and script interactively. CTRL is equipped with a gripping tool but the company plans to expand attachment offerings to include options like spray nozzles and engraving tools. Also in the box is a gripping tool, with a range of interchangeable arm tools to follow including suction pads, spray nozzles, laser engraving tools and more. The team has also made this technology open-source, themechanical, electronic and firmware source, so users can invent their own tools and 3D print them. With a full range of movement through 6 axis articulation, CTRL the Robot can lift and carry with incredible precision. It uses specially designed brushless servo motors for smooth motion. Even though it roughly stands at the height of a piece of A4 paper, it can reach as far as a human arm and carry up to 1.7 pounds (750 grams). The team used a custom cycloid gearbox design with a pass-through encoder that was conceived, designed and prototyped. The gearbox is highly efficient and can be back driven. It has multiple contact points and offers zero backlash.